It is obvious to many the impact urban renewal had on Joplin’s downtown area. While the parking lots are many, many may not recall what once stood in those locations. 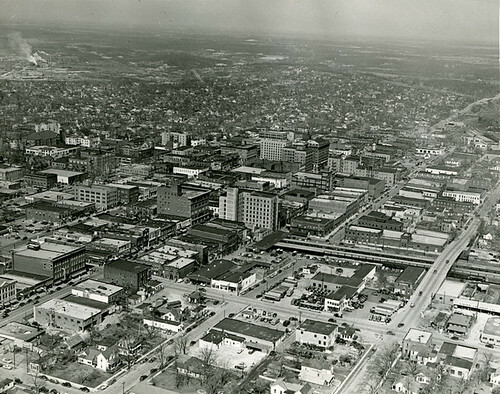 In the photograph below, taken in 1955, we have a rare opportunity to see the downtown of Joplin right before the beginning of urban renewal in the following decade. See how many of the historic buildings you can spot. We’ll post again this weekend pointing out what is where. Printed with permission from the State Historical Society of Missouri. Close up on the downtown area. Feel free to click on the images for slightly bigger versions. Unfortunately, the internet publishing policy of the State Historical Society prevents us from offering larger versions.